Home » Blog » Empower Sales Conversations » Quantifying Customer Value: How Good Do the Data Have to Be? Quantifying Customer Value: How Good Do the Data Have to Be? Posted in Empower Sales Conversations, Improve New Product Launch, Increase B2B Sales, Presales, Pricing, Product Marketing, Quantify Customer Value, Sales, User Content, Why LeveragePoint? The benefits of value-based strategies are clear.1 B2B enterprises win by selling differentiated offerings. 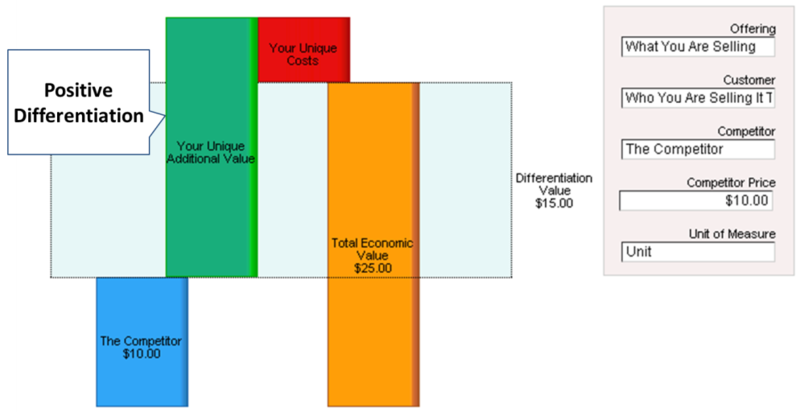 They win profitably by realizing prices that reflect the customer value of that differentiation. They win profitably and consistently by understanding and communicating the value of their offerings to their customers. So why don’t companies implement value-based strategies faster? The Problem. The common thread running through these answers is that no value strategy can get underway without perfect data. Sometimes imposing a requirement for exact data becomes an excuse for never trying to have a customer value conversation at all. The quest for impeccable data often accompanies an approach to marketing process centered on project plans with well-defined endpoints. The presumption at project completion is one of content perfection. When the marketing collateral is delivered, the team breathes a sigh of relief, someone declares “that’s a wrap” and the marketing team moves on to the next project. Marketing’s job becomes one of providing discrete deliverables instead of driving a continuing process of ever-improving messages and content. Don Draper’s accounting department would have approved of this approach as a 60’s/70’s discipline to generate faster advertising agency invoices. This static, deliverable-oriented, marketing mission ignores the opportunity of ongoing content improvement made possible by the digital age. Data perfection is unnecessary when sales tools can enhance customer conversations and when the conversations themselves provide feedback that helps improve the tools and the data. Waiting for exact data delays value conversations, slows the feedback loop and impairs performance. Agile Marketing. In a cloud world, marketing can and should be agile. Agile marketing involves: (1) designing an initial version (v1) to limited objectives, (2) developing v1 fast, often in sprints, (3) testing v1 quickly and (4) iterating rapidly to improved versions. Value-based strategies work best when deployed through an agile marketing process where the content and data are continually improving. Let’s look at best practices for value quantification to see how good the data need to be for v1 and beyond. Agile deployment of Value Propositions in marketing and sales provides its own quality control, resulting in ongoing refinement of the Value Propositions and the data that are used. In what ways is it better and how much better is it? What is that worth to the customer? To be useful in sales conversations, a good Value Proposition boils the answers to these questions down to the two to four ways that our offering is better than the competition and what that is worth to the customer. A good Value Proposition quantifies these differentiators in a way that is clear and simple, cutting through technical complexity. Compared to what reference point? Our offering’s positive differentiation creates value for that customer that can be highlighted and articulated as value drivers. Let’s look at each of these elements in turn to understand how to start and how agile marketing results in ongoing improvement. How does my offering reduce my customer’s costs? How does my offering increase my customer’s revenue and profitability? How does my offering reduce customer risk and what is that worth? 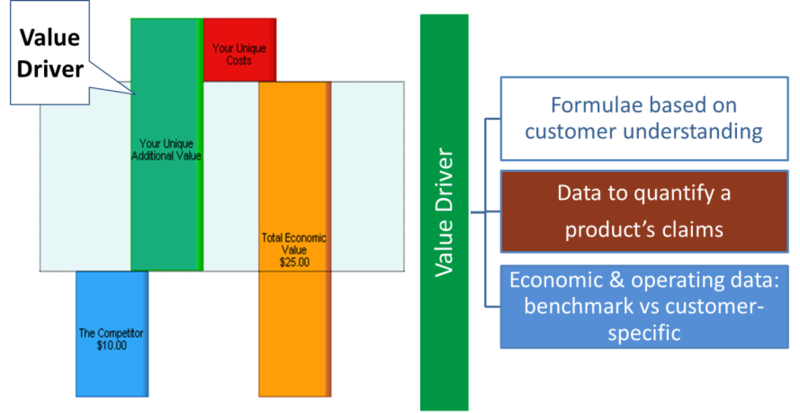 The value driver formula picks out key elements of the customer’s market and operations as a basis for quantifying value, using data that capture product claims to provide a clear comparison between a competitive reference point and our offering. These formulae are invariably created by teams who generate hypotheses which they test with experts, experienced sales reps and/or selected customers. Formulae usually start simple. They often evolve to a more detailed and analytical form as the team gets deeper answers from their tests, understanding the customer better. Simplifying and suppressing detail is necessary to prepare the Value Proposition for sales use and effective communication. The formula itself is a way to present important information. It can be displayed in a way that highlights key data and shows clear calculations transparently. Or it can be complex, obscure, hard to follow, shown with too much information or include irrelevant detail. An agile marketing process should consider how formulae are presented, test alternate approaches and improve the presentation of the Value Proposition based on sales experience. Suppressing detail can help improve the clarity of most conversations. Structuring formulae and initial formula display simply to support these conversations is usually good. Value Proposition design is even better when it also supports the transition to drill-down discussions, possibly involving our own subject matter experts. Those conversations are more effective in building customer consensus when detailed build-up of summary variables and the sources of information are accessible even if they were not visible on the surface. Great cars have simple controls that the average driver can use confidently but also have great engineering under the hood that is appreciated by good mechanics. Product Claim Data. Scientists and management consultants love well-designed statistical research. Studies engage their intellect. Evidence-based decisions are their mantra. Study design is an integral part of their training. Performing extended studies can be part of their full employment plan. Extreme examples can be found among drug developers, conditioned by FDA approval requirements, who only find comfort in randomized, multi-center, double-blind, placebo controlled, clinical trials. Trials that take years to perform, cost millions of dollars and sometimes deliver ambiguous results. For value conversations, product claims data rarely need to be this rigorous or this expensive. Start with an initial hypothesis of quantified product benefit. Even the most meticulous development studies start with quantitative hypotheses before they test anything. Next have an internal conversation with the development team or the technical team to test and refine the hypothesis. Then talk to a beta customer or an early adopter. These conversations usually transform an initial hypothesis into data “based on anecdotal evidence” at a minimum. With a modest amount of additional process and presentation, the data become “based on case studies,” “based on customer interviews” or “the results of a survey.” More detail on the sources of the data (even if they are anonymous) bolsters credibility. If needed, these data can help inform well-designed market research or outcomes studies. None of these data sources adheres to the exacting methodology of scientific development studies. Even in a medical context, the vast majority of customer value claims don’t require an expensive study. Yet these data sources support a product claim and support good conversations about a product’s differentiation and what that is worth. More importantly, using hypotheses and approximate data as a basis for conversation helps to refine the data themselves through feedback, identify credible data sources and build the quality of the Value Proposition with experience. Economic and Operating Data. It doesn’t take an MBA or a CPA to quantify the effect of a product on a customer’s business. Initial economic, market and operating data can almost always be generated quickly through some combination of publicly available sources, sales rep knowledge and expert knowledge. Where there are gaps in the data from these sources, a plausible initial hypothesis is a good place to start. Testing v1 with beta customers and early adopters helps improve the quality of the data. Often it also helps identify customer segments, situations and competitors where a modified version of the Value Proposition with distinct data makes sense. Public sources, interviews, surveys and case studies can be usefully supplemented with more formal market research and outcome studies. But waiting for formal studies to start the customer dialog misses an opportunity. Most customers are willing to engage in conversations specific to their needs and situation. That includes providing specific data. Customers are often trying to figure out whether to invest time and internal political capital in a purchasing process. Having a better understanding early of value specific to a customer’s business helps the customer make better decisions. It also helps the sales rep qualify the account as a target. Too many empty blanks. Some Value Propositions are designed with a long list of questions before any estimated Customer Value is available for a conversation. These Value Propositions are rarely successful. Sales reps have to spend extra prep time getting answers before their customer call. Worse still, reps have to spend scarce customer time in cycles of discovery without knowing the payoff. Customers get tired of answering questions without understanding why. Some customers stop answering questions altogether, perhaps out of concern for confidentiality or perhaps because they get suspicious as to why the rep is asking. The best Value Propositions make it possible to have a value conversation with no customer specifics, usually based on a combination of benchmark data and other customer experience. They start with a value answer and highlight a few pieces of benchmark data where it is easy and natural for the customer to react by providing their own specifics. This process of incremental tailoring and customizing in a series of conversations allows for gradual customization of a Unique Value Proposition without creating the customer experience of a trip to the dentist to for a complete check-up. It also allows the conversation to go only as deep as necessary. And it facilitates early value conversations by the sales rep that work seamlessly with the later involvement of technical pre-sales or subject matter experts in the customer value conversation. Apart from the last concern, these are all addressable with good Value Proposition design, good content, good training and well-communicated motivation coming from other reps’ experiences and successes. Value selling can become a viral habit of sales with good Value Propositions and a good adoption plan. 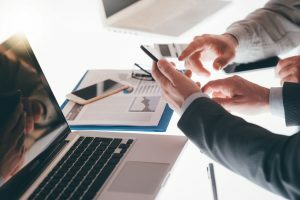 With customer engagement comes feedback, including customer data that can help improve the general Value Proposition and customer-specific data that can be useful to other reps in other sales situations. Ultimately, easy access to general value propositions and relevant customer-specific value propositions make the next sales conversation better. An agile approach makes this repository of useful tools better and better. Summary. Great Value Propositions help sales teams win. Value Propositions are useful in a number of ways to accelerate sales and improve profitability. Not only are perfect data unnecessary, but requiring exact data can become an excuse, creating a barrier to implementation and improved performance. Sales professionals use Value Propositions in some ways and circumstances that don’t require specific customer data at all. 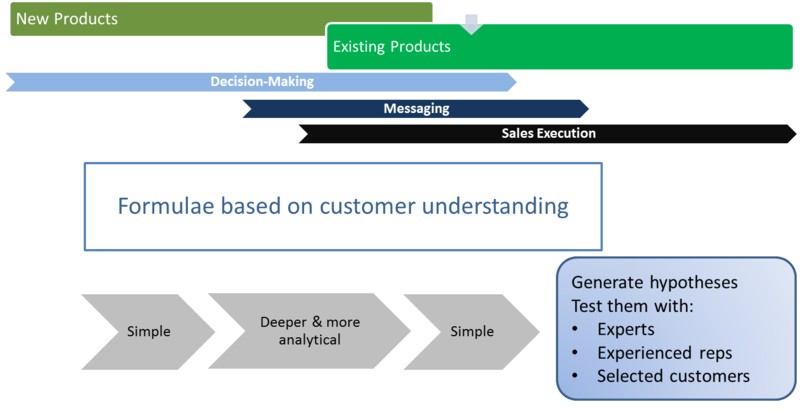 Where customer-specific data and strong product claims support the sales process, agile methods make it possible to start with plausible approximate or benchmark data and continue to improve the quality of the Value Proposition and underlying data quality based on customer conversations. Supporting those conversations and learning from them helps to translate specific customer experience into general sales success. So many businesses strive with the significant item of having a list of services to sell or cross-sell to existing clients. This is one of the difficulties, which is being able to create, understandable and price each of your relevant services. Once all that is in place, life gets much more convenient for both the business and those making a potential buying decision. By the way, thank you so much for the fantastic article.